N1WI meets from 7pm to 9pm on the last Tuesday of every month at St James’ Hall on the corner of Prebend Street and Packington Street N1. It’s a short walk from Angel tube station. Do you fancy coming along for a taster? You can make up to 3 visits with a donation of £5 per visit. We use this venue for Craft Group. 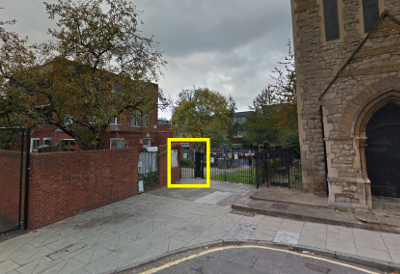 It’s at the end of Risinghall Street, opposite the end of Chapel Market. Please see the map below. The gate to the hall is just behind the church – if someone is not at the gate, ring the buzzer to be let in. The buzzer is on the wall to the left of the gate.